This is the tool that the artists use to get art from the Art Server to the Repository. For the part of HeroBlade that game designers use to get art from the Repository for the game world, see Repository File Selector. 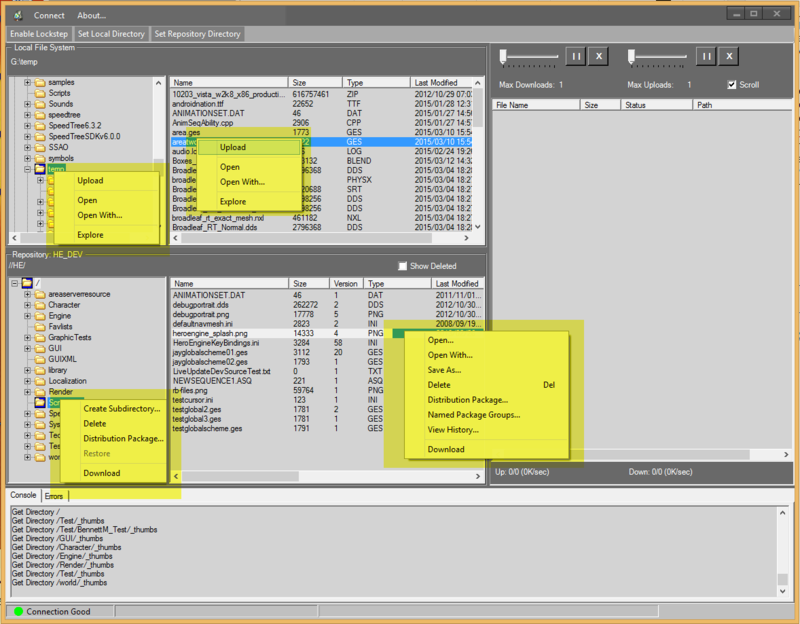 The Repository Browser is a separate client from HeroBlade. It is a tool that is used to move game content, such as art assets, from a local storage space such as your own computer or a network or the Art Server, to the live development environment so that HeroEngine can read it. It is most commonly used to manage art assets, meaning anything generated by an artist, such as Assets, Animations, and Textures. It can also be used for other things such as Effect shaders and Keybinding files. GUIXML files can be edited and new versions uploaded with the Repository Browser, but it is recommended to use the HSE2 Script Editor instead. The Repository Browser is available on the [downloads page]. Locate the Repository Browser icon on your Start page, or in the list of installer applications. 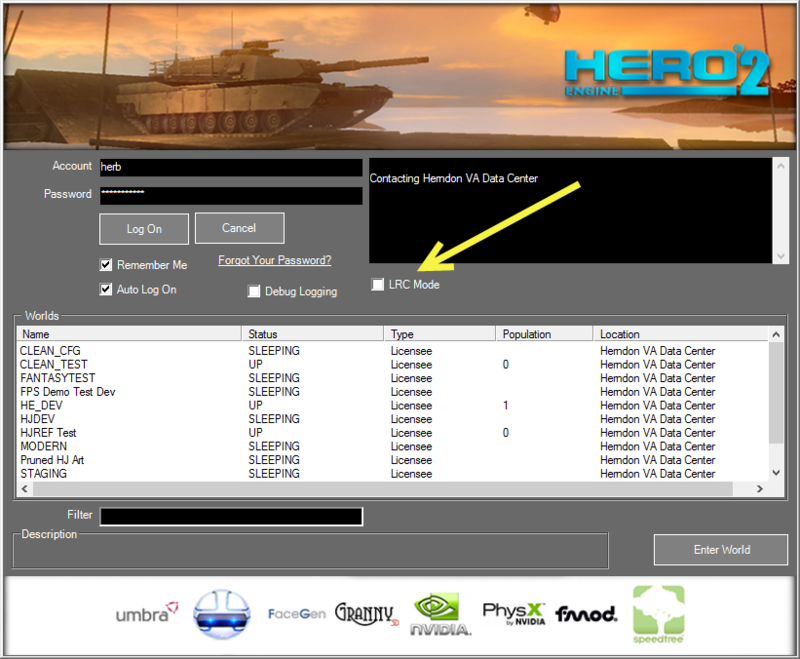 Enter your HeroEngine account name and password, then click "Log On". In the Worlds menu, select the desired world (such as "Dev" or whatever your world has been named), and click "Enter World". By default the Repository Browser will allow you upload, view, or delete files to the remote server repository, and download copies of those files to the local file system for editing and viewing. Alternatively, the Repository Browser can operate in "LRC Mode" which allows you to manually populate part or all of the Local Repository Cache (LRC). In older versions of the Repository Browser LRC Mode and file mode were integrated together. However, for performance and usability reasons, they have been separated into distinct user interfaces. Once an asset has been uploaded to the remote repository, it's available to add, view, and manipulate in the HeroEngine. When uploading, downloading, or validating a large number of assets in a predetermined directory structure, it's often helpful to ensure that both the local and remote directories are synchronized to each other. By selecting a directory in the Local File System window, and a directory in the remote Repository, the Enable Lockstep button will keep the displayed directories synchronized to each other. It will not proactively transfer or update files; that is left to the user. Beside using the upload and download context menu options, individual assets and directories may be copied using Windows drag & drop. The following drag & drop operations are supported. LRC Mode is enabled by selecting the "LRC Mode" checkbox on the login interface. This mode allows the user to manually populate part or all of the [[Local Repository Cache|Local Repository Cache (LRC)]. In older versions of the Repository Browser LRC Mode and file mode were integrated together. However, for performance and usability reasons, they have been separated into distinct user interfaces. This simplified interface removes the local file system window and associated controls and functionality. Right clicking on a directory or file allows the user to download the asset(s) to the LRC.